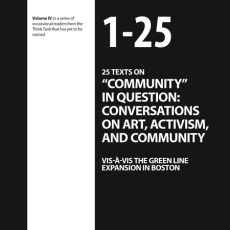 25 Texts on “Community” in Question: Conversations on Art, Activism, and Community was developed in April 2009 as Volume IV of the Think Tank's ongoing reader series as a way to explore the idea of community and the assumptions that inform this powerful concept. This reader was created by Katie Hargrave, Heath Schultz, Meredith Warner, Nick Jehlen, Jethro Heiko, and Jeremy Beaudry. Volume IV in a series of occasional readers by the Think Tank that has yet to be named explores the idea of community and the many assumptions, ambiguities, and boundaries that inform this powerful and oft-cited trope found in contemporary urban society. We believe that to better understand how community is defined — that is, created, delineated, cohered, dissolved, complicated, contested, infiltrated, invaded, and generally transformed — will prove instructive for guiding our — artists’ and activists’ — capacity for collaborating with diverse groups of people in the struggles for social, spatial, and economic justice. This reader accompanied the walking workshop “Community” in Question: Conversations and readings on art, activism, and community vis-à-vis the Green Line Expansion, which investigated the proposed public transportation expansion (MBTA Green Line) into Somerville-Medford and examined how residents respond to (both for and against) changes in transportation and how transportation affects their cities. The reader is organized into the following sections: Theoretical discussions on Community, Learning from Activists/Organizers: How to participate in a community, [Common] Space, Artistic responses to Community, Building Communities. As an appendix to the reader and to the “Community” in Question project, the Think Tank that has yet to be named also complied History & Resources on the MBTA Green Line Expansion. This is an incomplete but useful glimpse into the historical record regarding the Green Line and Red Line transit expansions in Boston. This entry was posted in Projects, Readers and tagged activism, art, community, gentrification, readers, urbanism on April 6, 2009 by admin.